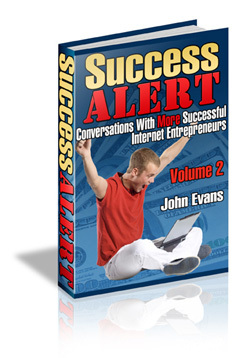 Last year I was approached by fellow entrepreneur Scott Evans to be featured in his new book Success Alert Volume 2 (if buying see the end of the post for a discount code). In the book he interviews 10 Internet entrepreneurs with various different business models, I received a review copy last week and have just finished reading it and it’s a really cool book. The book is organised by interviewee, with each asked specific questions relevent to how they’ve grown their business and increased revenue. Each interview is 20-30 pages in length, including a good summary of all pertinent parts, in total the book is just over 200 pages. Answers are both thorough and open, finding information on how much revenue different site generate is normally difficult if not impossible to do. So IMO Alert Success is a worthwhile addition to most entrepreneurs reading lists. I must admit I hate long sales page but they seem standard (and working) practice with books of this nature. The book costs $77 , as I’m featured in the book John has kindly provided a $20 discount code (quote SA2ALC) so our readers can buy Success Alert for $57. If you’ve read it please let us know what you think. Edit – I’ve been asked to remove URLs and names from this post, which as John is a good guy I’ve done, they are all shown in the book though. Why do you keep saying nut is included in the book? Thanks Mubin, I was asked to do a bit of swift editing to remove URLs so copied and pasted my mistype. Corrected now though. Is it an electronic book or a physical book? Is it an ebook or physical book? It’s an eBook but I think John has plans to have it published. Taking “Coolest Gadgets” as an example, look how he’s placed his Google ads and seems each review has Chika ads too. Al, there is another typo – you refer to Scott Evans in the first paragraph…. wow this is the sort of thing i love, thanks for covering it, off to order now! How do you feel being interviewed? Like a celebrity I bet. I am gonna get a copy for sure. I have always wanted to know the growth of coolest-gadgets and your approach to online business.